Which Colocation and Wholesale Data Center Operators in Northern Virginia (NOVA) Are the Most Digitally-Savvy? The data center industry is changing fast; and the Northern Virginia regional market is no exception. Since the earliest days of the Internet, Northern Virginia has been at the epicenter of IT growth. The U.S. Department of Defense's dependence on IT companies during the Cold War jump-started economic development in the region. Amazon Web Services (AWS) first launched from the region in 2006 (now known as U.S. East) and at one point had 70% of its racks residing in Northern Virginia. AWS found it easier to launch from the region because it could buy or lease older data centers instead of having to build its own. AOL (first in Tysons Corner, then in Dulles), MCI (Washington, D.C.), and UUNet all trace roots to Northern Virginia. Up to 70% of worldwide Internet traffic travels through MAE-East (Metropolitan Area Exchange East) in Ashburn, Virginia (Loudoun County). Northern Virginia is considered the busiest Internet intersection and largest data center market in the U.S.
Loudoun County expects there to be 6.5 million square feet of data center space online by 2021. Commercial electricity rates trend below U.S. national averages. The Virginia General Assembly has passed legislation that allows large data centers, meeting certain requirements, to earn a Sales & Use Tax exemption on qualified equipment. Although many might assume that this tells a big part of the story of the Northern Virginia data center market, it overlooks just how much buyer preferences have changed in recent years -- regardless of whether we’re talking about influencers or decision makers at data center end users, colocation and wholesale data center operators, or managed services providers. Starting with the release of the original iPhone in 2007, the way people research and make purchase decisions has changed drastically. Word of mouth. Cold calls. Cold emails. Interrupting people with obnoxious, self-serving advertising. Direct mail. Print advertising. All of these marketing channels that were mainstays of IT sales playbooks, literally for decades (1980s, 1990s, and early 2000s), have been called onto the mat. In nearly all cases, these channels have become far less effective and have gotten far more expensive. Ironically, the data center, mission critical, cloud services, and telecommunications industries have benefited greatly from all of this growth in demand. Yet many of those in leadership roles at these companies have failed to appreciate how these changes impact demand generation, desired customer experience, differentiation, competitive positioning, and their ability to stave off market disruption. Technologies like Gmail’s Priority Inbox make it tougher for any commercial email to make it to the Inbox. And do people answer their phones anymore without checking caller ID? The rules have changed for businesses of all sizes and shapes -- including colocation and wholesale data center operators in Northern Virginia. This behavior change completely upended the buyer’s journey for colocation and wholesale data center services -- the active research process someone goes through in between when that person begins searching for answers and when that person becomes a paying client. In the pre-iPhone era, potential clients reached out to IT companies, including data center providers, for information when they were 10% to 20% of the way through their decision-making process. Those days are long, long gone. Today, as much as 70% (or more) of their decision may be over before a potential client even reaches out to a data center operator. This change in the decision-making process presents enormous challenges to data center providers that are stuck in the past, using the same marketing and sales playbook that they’ve used since the 1980s and 1990s. But digital transformation also presents enormous market opportunities for digitally-savvy data center companies that can get found by the right influencers and decision makers, in the right places, at the right time, and most of all: in the right context -- to be seen as trusted advisors and educators, rather than just data center vendors. In the Northern Virginia Data Center Market Opportunity Report, we’ll explore which colocation and wholesale data center operators in Northern Virginia are the most digitally-savvy -- and doing the best job keeping up. We ended up with 25 data center operators -- which we believe will further contract as more mergers are announced and completed in the coming months and years. The data centers are located in Ashburn, Chantilly, Dulles, Fairfax, Gainesville, Herndon, Manassas, Middletown, Reston, Sterling, and Vienna as well as Beltsville, Maryland, Silver Spring, Maryland, and Washington, D.C. While we don’t believe that these 25 companies represent all of the outsourced data center operators in Northern Virginia that meet the criteria, we do believe that the companies included are representative of how digitally-savvy data center providers in Northern Virginia are. Just as a balance sheet is a snapshot in time, the data in this report was gathered during a one week period in October 2017. It’s fully expected that the data center providers within this report, and others that read this report, will make changes to their websites. And as mentioned earlier, it’s fully expected that industry consolidation -- the mergers and acquisitions -- will continue to change the names of some of the data center providers listed in this report. However given that several of the data center providers in this report had let their websites sit stagnant for literally years, there will be some resistors who believe that their clients are different -- and don’t use search engines, social media, or smartphones (even though their clients’ companies spend anywhere from tens of thousands of dollars to millions of dollars per year on colocation or wholesale data center services). And just to be clear: None of the colocation or wholesale data center providers in this report paid for inclusion/sponsorship and none, at the time of publication, have a financial relationship with the report’s publisher: the Data Center Sales & Marketing Institute or its parent company SP Home Run Inc. In a world where potential clients are very far along in their buyer’s journey before data center providers are even looped into the conversation, what influencers and decision makers learn online about colocation and wholesale data center providers makes an enormous impact. One of the best ways to stand out from the pack and differentiate is by being regarded as the definitive subject matter expert on anything and everything having to do with your future clients’ questions and problems. Nearly all of the data center providers in Northern Virginia, researched for this report, spend the majority of their digital presence talking about themselves, rather than their prospects’ and clients’ biggest problems, questions, and concerns. Website visitors that don’t find what they’re looking for on a website will hit the back button almost immediately and not return. With tens of millions of internet users logged into Google-owned servers every day, Google knows when a website has provided a lousy user experience and de-prioritizes that website in its ranking factors (effectively penalizing it). Wow! This content is super-helpful. I’ve been looking for the answer to this question for hours (days, weeks, etc.). I can’t believe I finally found it. And when this type of value-exchange occurs, a website visitor trading their contact information for free access to premium content with high-perceived value, the data center provider earns the right to begin a relationship with that individual -- to continue educating that person and building up more trust. For anyone that’s ever observed the finite amount of real estate available on page one of a search engine results page, it’s no big secret that only ten organic, or earned, slots are available. And if a data center provider's website isn’t deemed worthy of the “top 10” list, very few people will ever venture beyond page one -- at least for that particular keyword phrase or topic. So visibility is truly a zero-sum game. If a data center provider suddenly earns a desired page one ranking, by very definition another entry on that search results page is being bumped or demoted off of page one. Aside from all of these factors analyzed earlier, with regard to differentiated thought leadership and website authority, what else does a colocation or wholesale data center provider in Northern Virginia need to worry about for digital readiness? In this section on Competitive Positioning, we examine which data center providers in Northern Virginia are currently best positioned to digitally-elbow other entities out of their way in the race to get found by the right people, in the right places, at the right time, and most of all in the right context. In a world that’s undergoing such massive digital disruption, where software, artificial intelligence, and machine learning are devouring entire industries, people have completely changed how they research and make purchase decisions. For anyone that doubts how much mobile computing, the consumerization of IT, search engines, and social media permeate our lives, think about how many stores and restaurants have free WiFi, active social media profiles, and heavily promoted website URLs. The big search engines have taken notice as well. As a result, a data center provider can no longer win the battle for search engine visibility without also competing on social media. All those little numbers at the top of blog posts, quantifying the volume of social media activity across Facebook, Twitter, and LinkedIn for example, aren’t just vanity numbers -- like the number of millions or billions served on the iconic McDonald’s Golden Arches signs. Those social media activity metrics are also factors that determine a data center provider's level of visibility -- or conversely, invisibility. Earlier in this market opportunity report, we looked at several individual metrics that impact thought leadership strategy and visibility --- including LinkedIn participation of the company’s CEO, sales director, sales and business development employees, marketing director, and marketing employees. Even as few as a dozen employees that are active on LinkedIn can really begin to move the needle in aggregate. But what about social media visibility at the company level? How are data center providers in Northern Virginia doing with growing their company footprint on social media? Across LinkedIn, Twitter, Facebook, and YouTube, we examined both the number of followers and number of updates posted during the past 30 days. Both factors matter a lot. In much the same way that a stale website footer copyright year infers that a company either isn’t staying current -- or worse yet, may be out of business, a stale social media profile sends a similar negative brand impression to visitors, search engines, and the social media platforms. 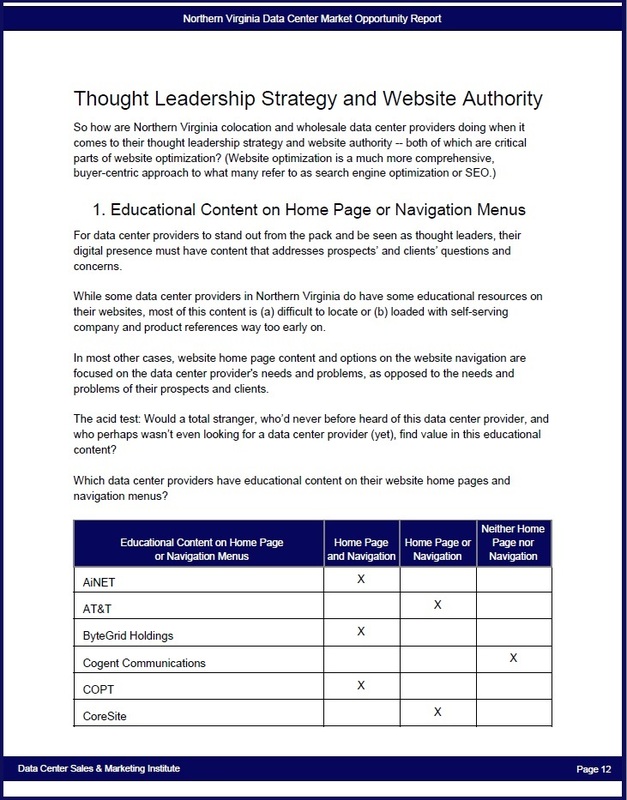 Next, in the quest to determine which data center providers in Northern Virginia are the most digitally-savvy, we looked at how each company’s website is positioned to generate leads. After all, why would a data center provider invest in differentiation and thought leadership if those initiatives weren’t focused on generating leads, sales opportunities, and new clients? Why would a data center provider bother trying to improve its competitive positioning or social media presence if not for improving its ability to attract more of the right influencers and decision makers, in the right places, at the right time, and most of all in the right context? Now granted, much still has to happen in between lead generation and revenue generation -- typically segmenting leads by buyer persona and buyer’s journey stage, nurturing those leads to continue educating, building trust, and accelerating leads into sales-ready opportunities, and ultimately closing some of those sales opportunities into new clients. But for this report, we’re focusing on metrics that can be ascertained without an insider’s perspective. Earlier on, we introduced the concept of educational content, buyer personas, and the buyer’s journey. Now, we’ll look at five additional factors that determine whether a data center provider's website can generate the kinds of leads that materialize into their ideal clients. In particular, we’ll look at whether each company’s website grasps the concept of website conversions for lead generation, whether the website has educational content available for lead generation purposes, and whether there are calls to action (CTAs) on educational blog posts that facilitate lead generation in the right context. Just like businesses in general, data center providers in Northern Virginia are all over the map regarding their digital readiness. That’s one of the reasons why the data in this market opportunity report is so eye-opening. And when a data center provider wants to differentiate in the modern buyer’s journey, use thought leadership to improve its website’s authority, bolster its competitive positioning, benefit from a stronger social media presence, and generate high-quality leads from its website, sometimes that data center provider tends to be a little impatient -- expecting results to happen...yesterday. When unrealistic expectations creep into the strategy conversation, it’s important to temper these expectations with a healthy dose of reality. What can a colocation or wholesale data center provider do to speed things up, once it has a solid foundation of digital assets intended to attract the right people, at the right time, in the right places, and in the right context? Paid search acceleration can be a very effective way to run tests and get results faster, while a data center provider is slowly but surely taking the right steps to earn organic search traffic and grow its organic social media reach. No matter how digitally-savvy a data center provider is, when it comes to differentiation, the buyer’s journey, thought leadership, website authority, competitive positioning, social media, lead generation, and paid search acceleration, there are a handful of digital infrastructure issues that must be addressed. With near perfect parallels to the English proverb about the shoemaker’s children going barefoot, data center providers that are generally in the Infrastructure as a Service (IaaS) business often neglect their own needs for relatively inexpensive infrastructure to support sales, marketing, and revenue growth. The world is changing fast. Across nearly all demographics that would be a client of a colocation or wholesale data center in Northern Virginia, use of search engines, social media, cloud computing, and mobile devices have all reached strong levels of mainstream adoption. This changes everything. It’s no longer a seller-centric research and purchase decision. And software, artificial intelligence, and machine learning are devouring entire industries -- which actually bodes very well for future growth of the data center industry. Buyers are now in the driver’s seat. That means potential clients will decide when and if they start a conversation with a data center provider they’re considering. With as much as 70% or more of potential clients’ minds already made up before a data center provider is even aware of potential client needs, how do data center providers stay relevant and compete effectively to win over digitally-savvy clients? How can these data center providers attract the right influencers and decision makers, in the right places, at the right time, and most of all in the right context? In this report, we set out to answer the question: Which colocation and wholesale data center operators in Northern Virginia are the most digitally-savvy? While very few of these data center providers are firing on all cylinders when it comes to differentiation, thought leadership, competitive positioning, social media, lead generation, paid search acceleration, full-funnel revenue growth, and digital infrastructure, there nevertheless are sharply pronounced differences among the 25 Northern Virginia data center providers analyzed in this report. Companies appearing in this report, as well as providers that compete with those in this report, should use the sections, categories, and what constitutes the highest rating in each section to focus their efforts on continuous improvements in the coming months. As mentioned earlier, however, everything starts with and needs to be grounded in setting SMART goals, creating buyer personas, and guiding buyer personas through their buyer’s journey. We appreciate the interest and support of the Northern Virginia Data Center Market Opportunity Report -- and wish data center providers great success in capitalizing on new market opportunities through stronger differentiation, thought leadership, website authority, competitive positioning, social media, lead generation, paid search acceleration, digital infrastructure, and full-funnel revenue growth.